The next upcoming Columbus Day is on Monday October 14th, 2019. Columbus Day is on the second Monday of October. 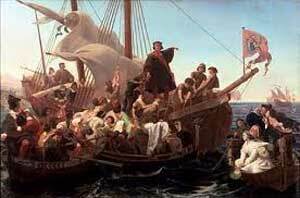 It marks the anniversary of Christopher Columbus' arrival to America on October 12, 1492. It is a federal government holiday so most government office are closed. It is a public holiday in most of the United States but may not be a day off in some states. Another national holiday with old historic roots in America is Thanksgiving Day, which was first celebrated in 1621 in Plymouth, Massachusetts celebrating a good harvest. Celebration of Columbus Day varies in different parts of the United States ranging from big parades and events to special church services to complete non-observance. San Francisco is the country's oldest existing celebration with a Columbus Day Parade from the Italian-American community. Though New York prides itself as having the largest parade. Hawaii's Columbus Day is also called Discoverer's Day or Landing Day. The first observance of Columbus Day was in San Francisco in 1869 as a celebration of Italian-American heritage. In 1906, Columbus Day became the first official state holiday in Colorado. In 1937, it became a federal holiday though people have celebrated it since the colonial period. The date of the second Monday in October was established in 1971.